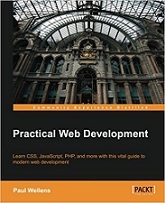 This book is perfect for beginners who want to get started and learn the web development basics, but also offers experienced developers a web development roadmap that will help them to extend their capabilities. Web development has grown to become vital in shaping how humans interact, work, learn, and consume. This book provides you with a roadmap of web development today, giving you the tools you need and the guidance to keep you creative and productive in a world of disruption and innovation. Paul Wellens has been a senior product manager for a major computer company in the Los Angeles area and Silicon Valley for over two decades.